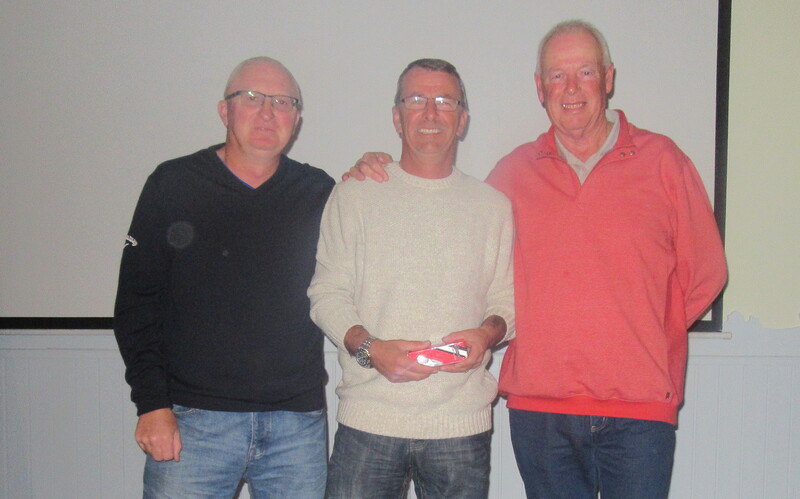 the winners, Robin, Dave, Tony and Jim……………. 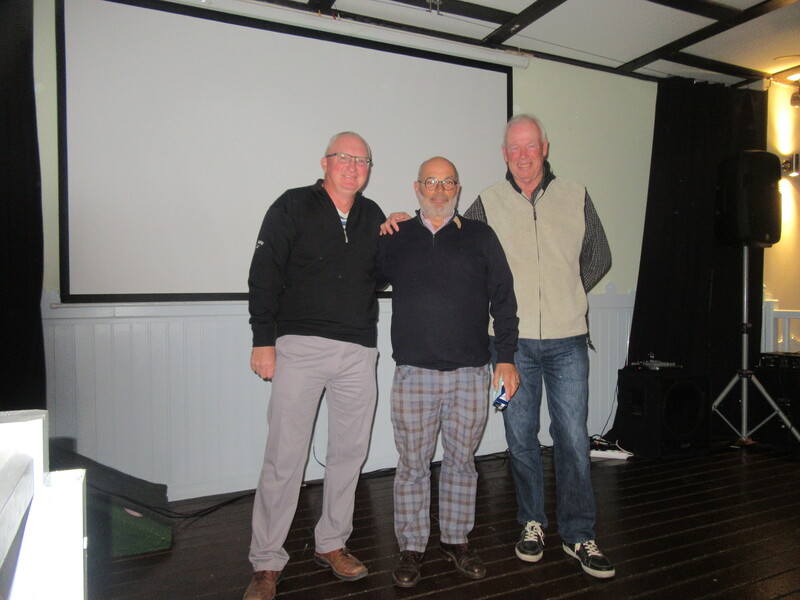 This week was a 4 person team (35 players) played in cold and very windy conditions, which was reflected in the high scoring. The winners this week didn’t have to score below 60 as is the norm. Thanks to Barbara Rollett who stepped in to do the starter’s duties. No photos from the course as I was not playing. Next week is the Anniversary Trophy where you can choose your own partner but then the 4 balls and times will be drawn out at 8 p.m. next Wednesday in the Clover. 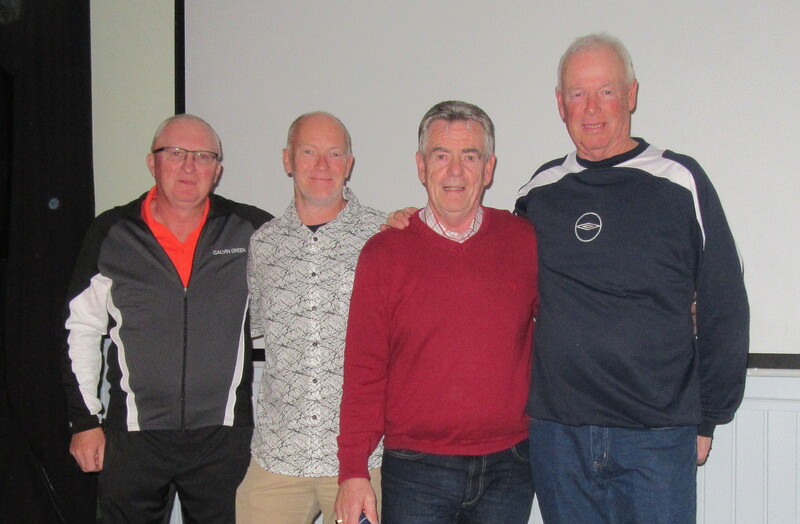 Still places for the evening presentation and meal (€15- 3 courses) but the coach is full (contact alicia@cdagolf.com). Green fees will rise next week for the start of the peak season. The management company have considered our concerns over buggy cost for players with some medical infirmity. Whilst it does not cover all our society golfers, the new conditions do address the problem for 12 month course members and rights holders who need a buggy for medical reasons. GNK will be offering a medical buggy rate of €18.75 per round to annual members and right holders, starting immediately. This is not available to 3 and 6 month members, or pay and play society players. The member can either pay the rate themself and invite a guest into the buggy, or share the cost with them. 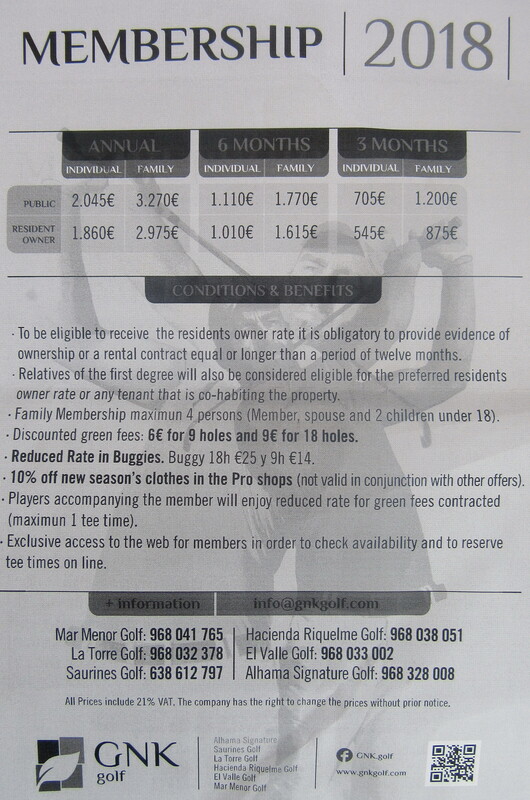 Basically it reduces the cost of a buggy from €25 for able-bodied golfers to €18.75 with a doctor’s note. So a member or rights holder will pay €9 + €18.75 (total €27.75). Anyone wishing to use this service will need to send a medical note explaining that they need to use a buggy in order to play golf. The annual general meeting of the Society will be held on the 1st Wednesday in March each year. (Wednesday March 7th 2018). This year the venue is in the Skye Bar, Al Kasar. meet 7 p.m. for 7.30 p.m start. 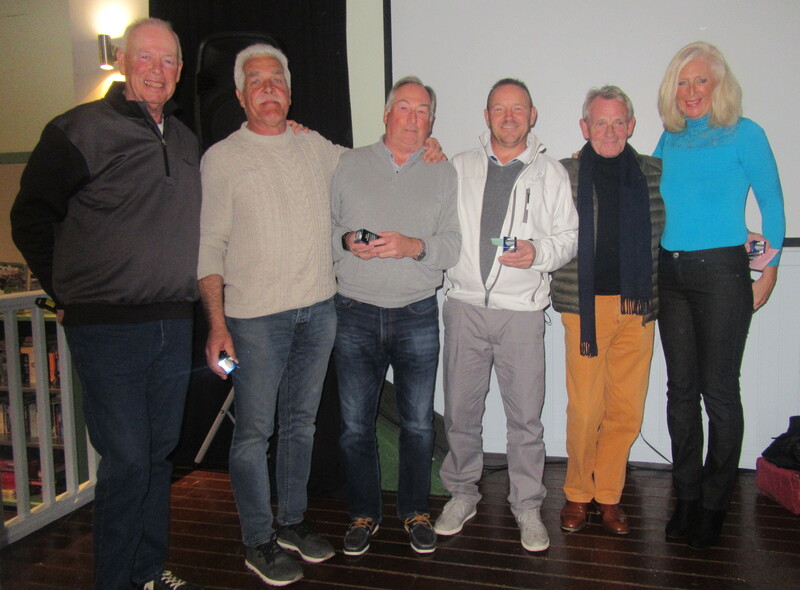 The committee will give notice of of the meeting 28 days in advance on the society website (Wednesday February 7th 2018) http://www.cdagolf.com as members reside all over the world. Locally a notice will be posted on the society noticeboard at Condado de Alhama golf club. 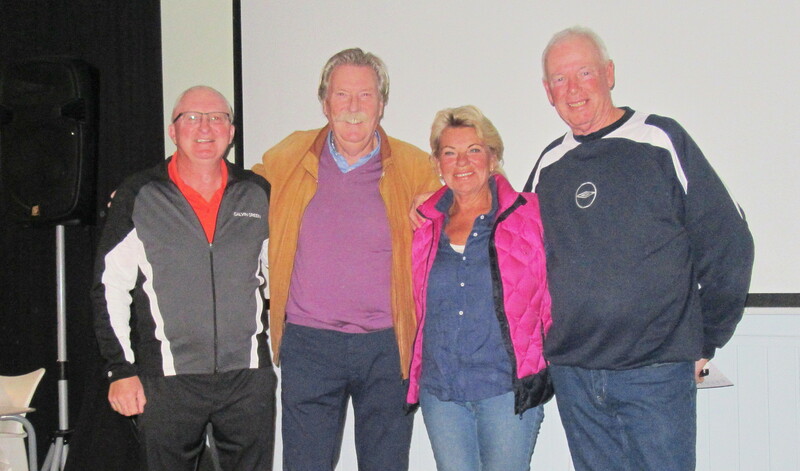 Members may propose resolutions for debate at AGM’s which must be given in writing to the secretary at least 14 days before the date of the meeting – (kim@cdagolf.com). (Wednesday February 21st 2018). This is also the cut-off date for applicants for committee. All resolutions and proposals must be proposed and seconded by existing members. Where a resolution is put to ballot by the attending members, a simple majority shall decide the outcome. In the event of a tie the chairperson of the meeting, usually the society captain (or in their absence the vice captain) shall have the casting vote. Chris and Maria, were you on this ship? One day the ship had an accident and sank. 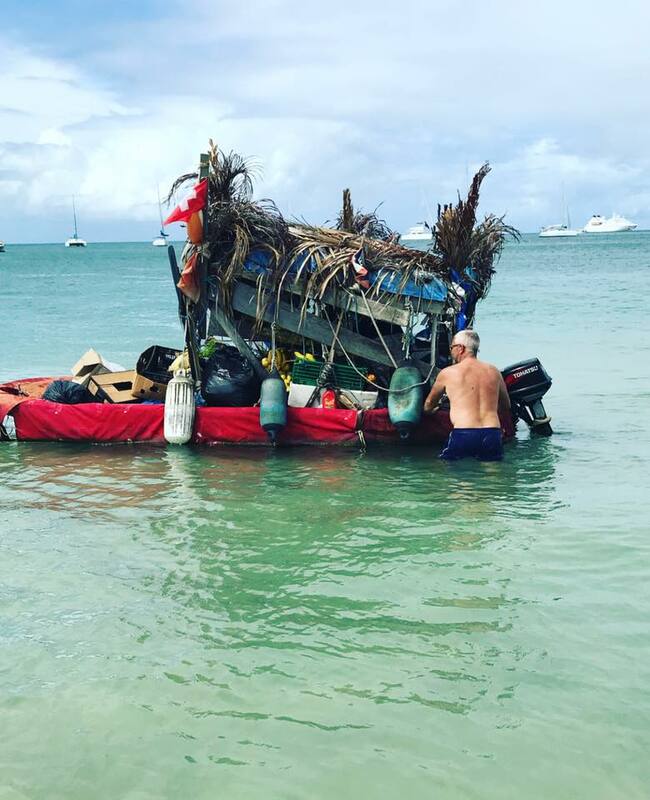 The magician found himself floating on a lifeboat in the middle of the ocean with the parrot, of course. Mr magic – Chris McAllister……….the parrot is sat inside………………….. This notice is the first stage in the organising of this year’s Viking Cup and only concerns the UK & Ireland Team. The event will take place on Tuesday 23rd October 2018 at Condado de Alhama. All players who competed in the 2017 Uk & Ireland Team are invited to apply for the 2018 team and will be automatically included in this year’s team provided their applications are received by 30th April 2018. Members who did not play in the 2017 team are also invited to apply for the 2018 team, they will be placed on a reserve list on a first come, first served basis. Friday was a straight forward individual event with 41 players. Overcast conditions throughout the day, with just a glimpse of sunshine as the players were completing their rounds. No overall winner with prizes for the 3 divisions. 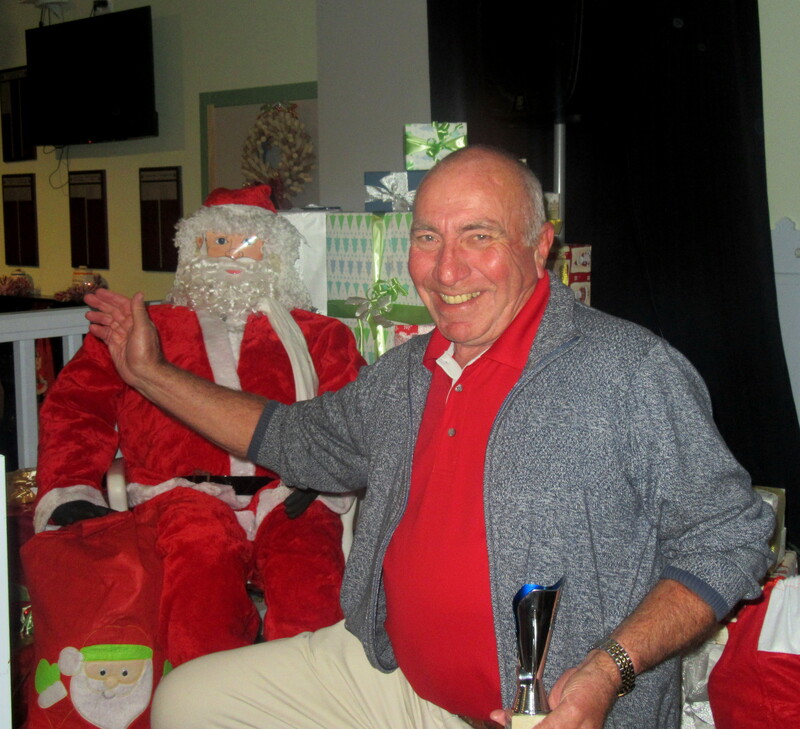 Rob was division two winner……………. 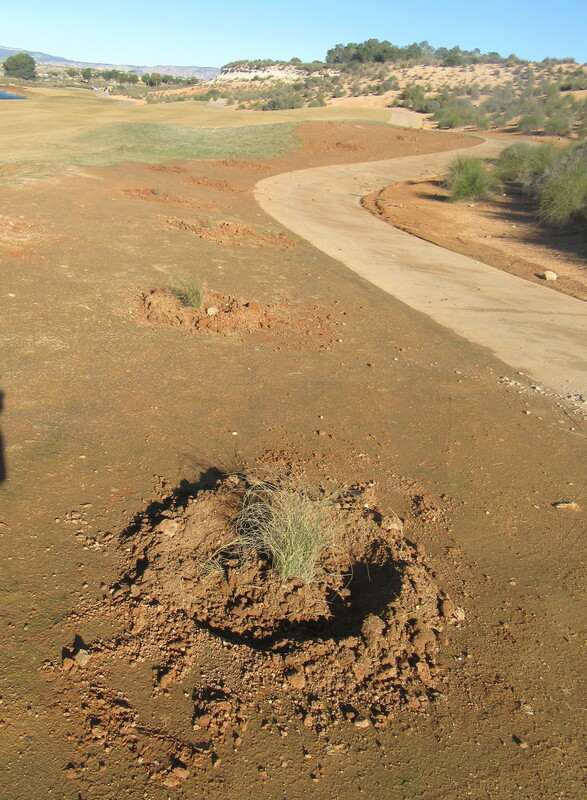 Lis was the best of the ladies………………..
our ducks take an interest………………..
Mike Maloney was a little long on the par 3 11th……..
work continues on levelling the rough areas – thanks for the GUR notice on hole 10……………. The start sheet for the Anniversary Trophy is now full and so is the free bus. If you want to be included, contact events@cdagolf.com but you must make your own way there and back as the 55 seat coach is now full. New GNK course couples membership. 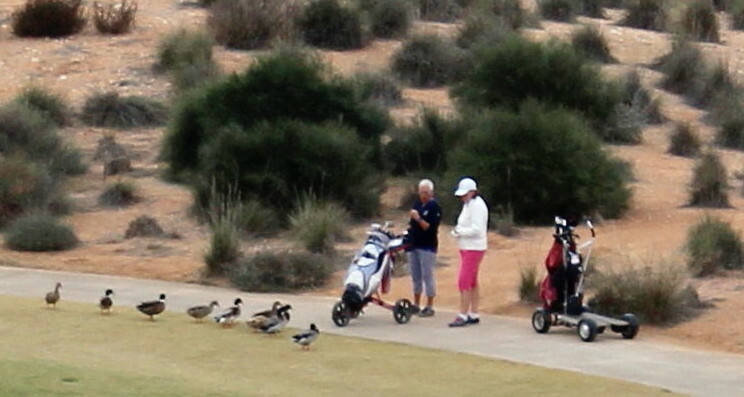 Following a successful lobby by GNK members the management has now created a couples only membership tariff. Full course membership details are shown below. 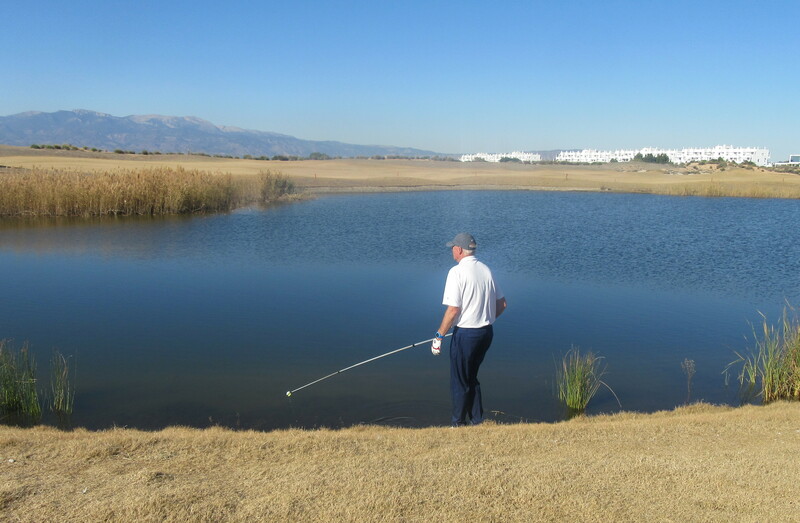 The awayday at Hacienda Requelme is Friday 23rd March with 18 tee times commencing at 11.36, with 22 buggies booked. It is a Dublin Crystal competition. It will be normal society rates including the current buggy policy. The society will provide a bus (leaving Al Kasar at 0930) and a lunch bag. 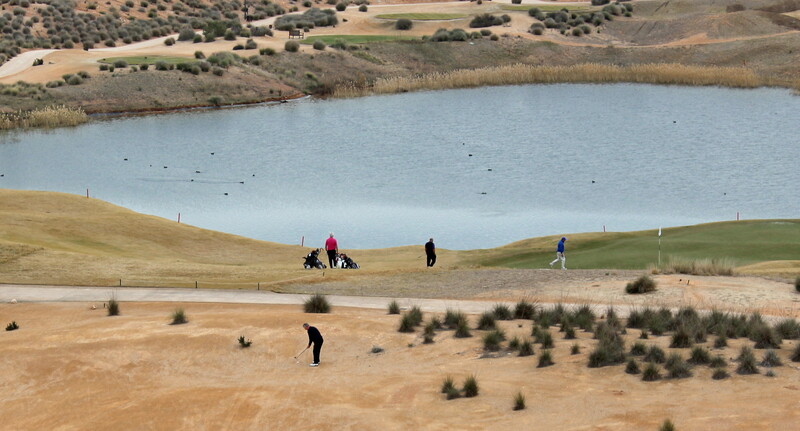 The Alhama course is fully booked that day by an outside agent. This week was a pairs event – 20 pairs took part in a surprisingly cold wind which belied the bright blue skies. 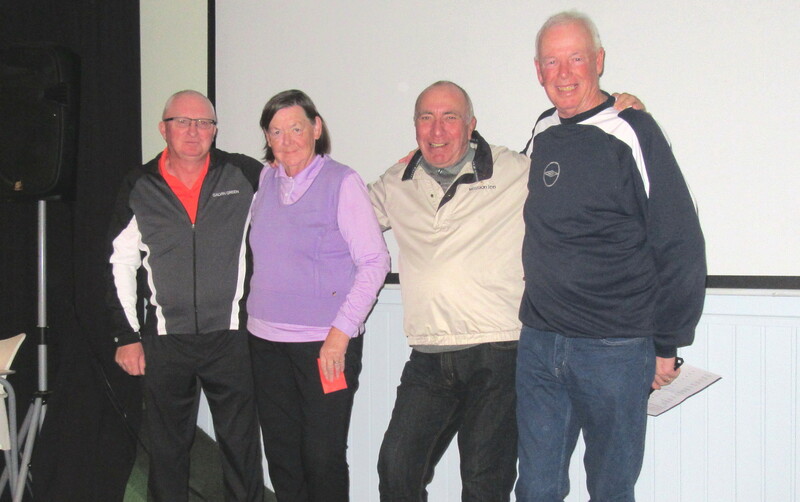 Thanks to Linda Thorburn for collecting the 2 euros and handing out the scorecards. Jan and Mike came out on top………………………. 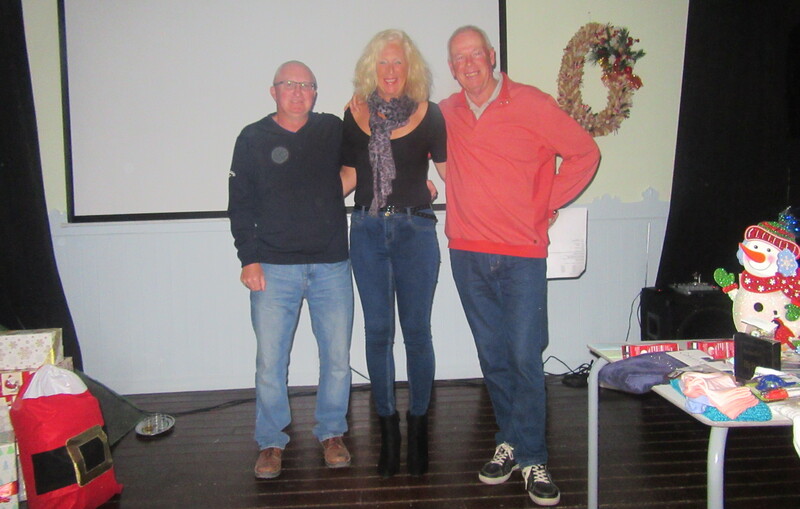 Sven Erik and Ellen were runners-up………………..
Lis and Jan were back in the prizes…………………. 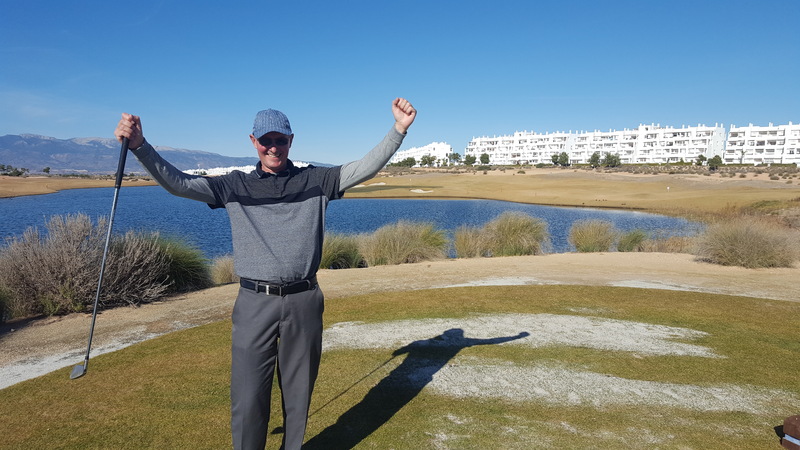 Perhaps the highlight of the day came at the par 3 11th hole, where Roger Price holed his tee shot! After taking a 7 iron, the ball sat motionless above the hole for a few seconds before a puff of wind? caused it to topple into the cup! Roger’s first ace, which many others have never experienced. well done Roger! 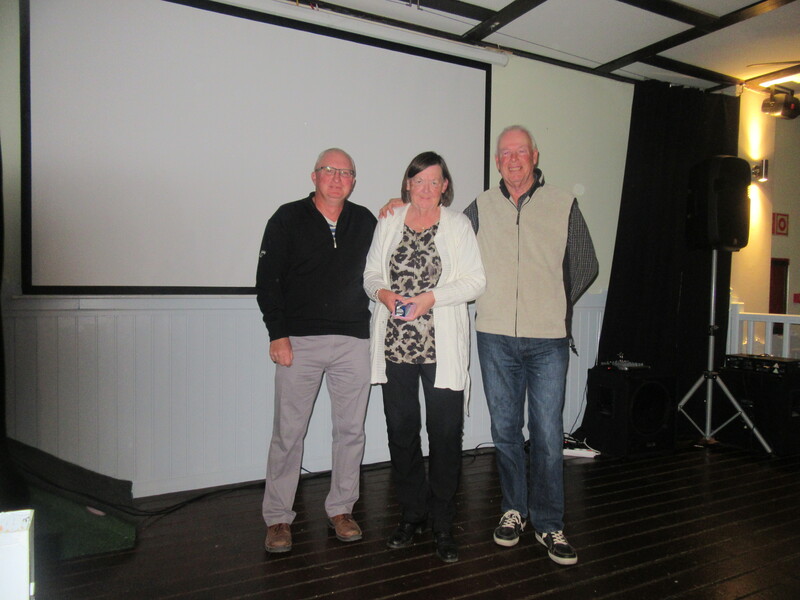 A trophy and a place on the ‘hole-in-one’ honours board! Don Henry almost made it onto the green on 11, but came out of the bunker quite nicely – couldn’t compete with Roger though………………. a spectacular setting on the ladies tee (16th) as Pat Whitty heads for home……………..
Just a suggestion to the greenkeepers – thanks for your efforts to improve the course, but can we have areas such as the example below marked as GUR, or a notice put on the desk (as is the case with the temporary green on hole one this week)? What a great finish last month for the annual Apollo Air champion! It was experimental, and with not having done it before we decided 6 qualifying results was fair to both regular golfers and occasional visitors. If 7 rounds were included only 20 players could have won – there were 30 players who managed to achieve the minimum 6 rounds. After analysis, we could have had 40 in with a chance if 5 rounds were needed. So this year, that is the aim – get 5 rounds in during 2018, and more golfers in the shake-up. Also with it looking increasingly likely that there may have been a tie last year, the tie-breaker would have been the 7th best score (not needed). 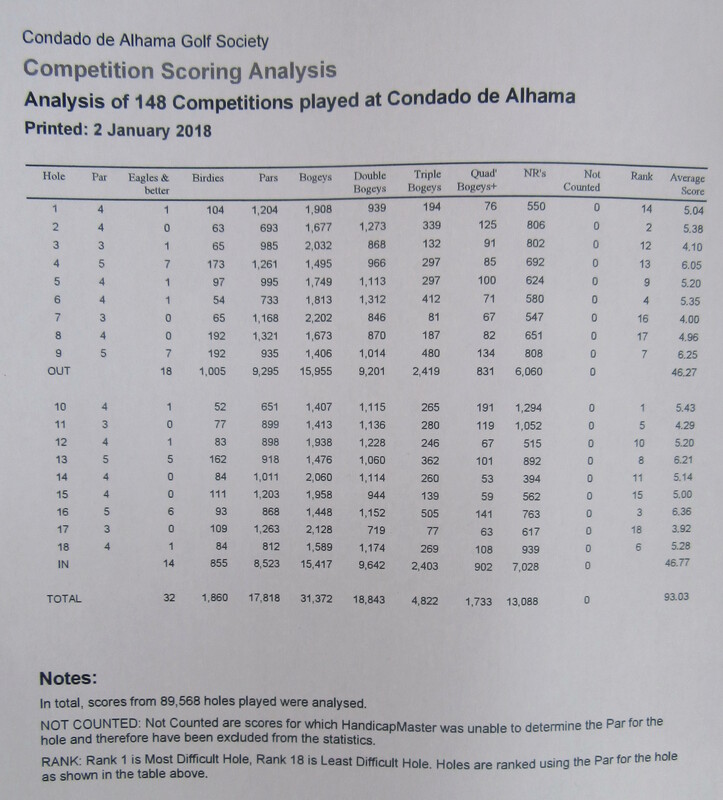 This year with only 5 scores required this figure is not realistic, so we have reverted to a typical decider – if the leaders are level after the 5 best scores have been added up, go to the last 3 (best scores), then 2, then one if necessary. Next week is a straight-forward individual stableford. 1) Existing members that play regularly. 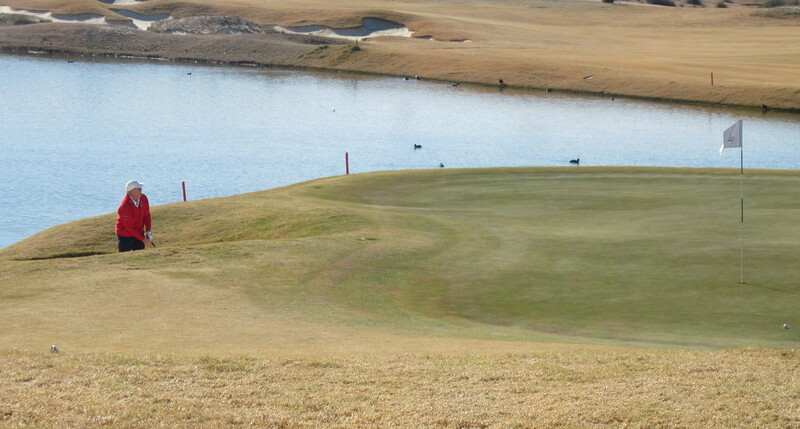 Members that play regularly or solely at Condado will have their society handicap maintained by the committee. Members need to play at least 4 qualifying rounds a year (1st April – 31st March) for their society handicaps to remain active. Only active players may win a society competition. An annual review will occur in December each year after the last qualifier of the year, any player that has not played 4 times during the current year will be marked as in-active. Only players that have played at least 4 times in the current period and 8 times or more in the current and preceding review period will be included in the annual review and be open for handicap adjustment. Members that play between 4 and 8 times in the current and preceding review period, will not be subject to the annual review but their handicaps may still be adjusted under “General Play” guidelines if the committee consider it suitable. 2) Existing members that do not play regularly. It is only by the analysis of a players performance over a number of games that the society will be able to determine if their current society handicap is a true reflection of the members playing ability. Therefore, in line with regulations, members that do not play a minimum of 4 qualifying rounds a year will be marked as having an “inactive” handicap with the society. The society recognises that in the majority of such cases the member will have an active handicap from their home club, in these circumstances and where the member can show evidence of an active home handicap, the member will not be required to submit the three cards to reactivate their society handicap. When a player cannot provide evidence of an active home handicap they may still play in Society times off their old society handicap but may not enter a competition until three cards have been submitted and their handicap reviewed and re-activated. At the time of annual membership renewal Current Handicap Certificates from the members Home club must be shown to a member of the committee and any necessary adjustments will be made. Existing members that have an active handicap outside of Condado are required to inform the committee of any changes to their home handicap. Where there is a difference between the existing society handicap and the one from their home club ( after conversion if required ) an adjustment will be made. In the cases where the members home handicap is more than two shots different to the Society handicap there will be a review carried out by the society handicap committee. New members are required to have taken part in a least one Society singles competition to be eligible to win a society Major competition. In the event where no prove of an active handicap can be produced then the following process will apply. 3a) A new player who has just taken up the game. The member will be assigned a temporary handicap of either 28 for men or 36 for women. The member should complete and return the cards from 3 rounds of golf, played with and counter signed by another full and active society member to the committee who will then assign an updated active handicap. 3b) A new player who has previously played but does not have an active handicap. The member will be assigned a temporary Society handicap equal to his current inactive handicap. 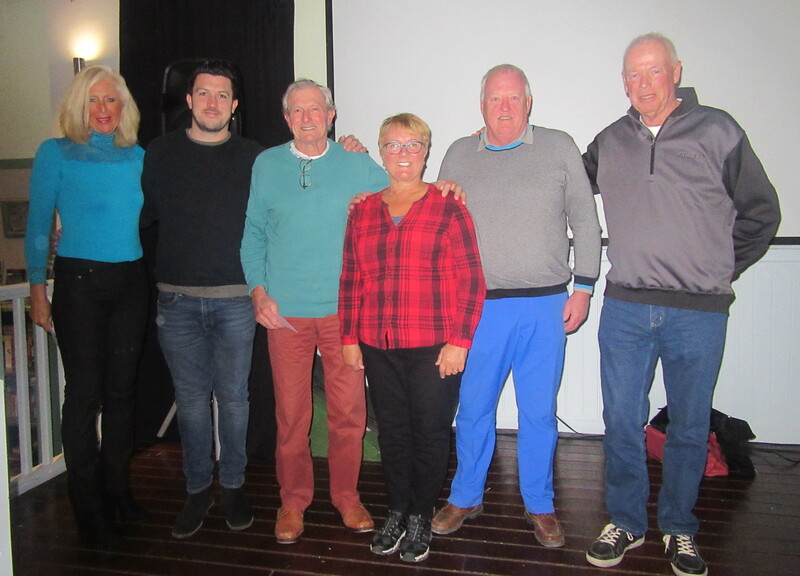 ( After conversion if required ) The member should complete and return the cards from 3 rounds of golf, played with and counter signed by another full and active society member to the committee who will then assign an updated Society handicap. In both cases the member may play in Society times but may not enter will not or be entitled win any event until the 3 cards have been returned and a Society handicap assigned. In exceptional cases, the society committee may adjust the player’s handicap between annual reviews if there is compelling evidence that his handicap does not reflect his current playing ability. Society handicaps are valid for use within the Society only and are NOT to be confused with official EGA handicaps. Jan is the one on the right……………………….. This was the first Apollo Air of the year, and also the beginning of the 12 competitions that will decide the annual Apollo champion. Fantastic weather for the 45 players with warm sunshine, no clouds and a slight breeze which seemed to help on most holes! 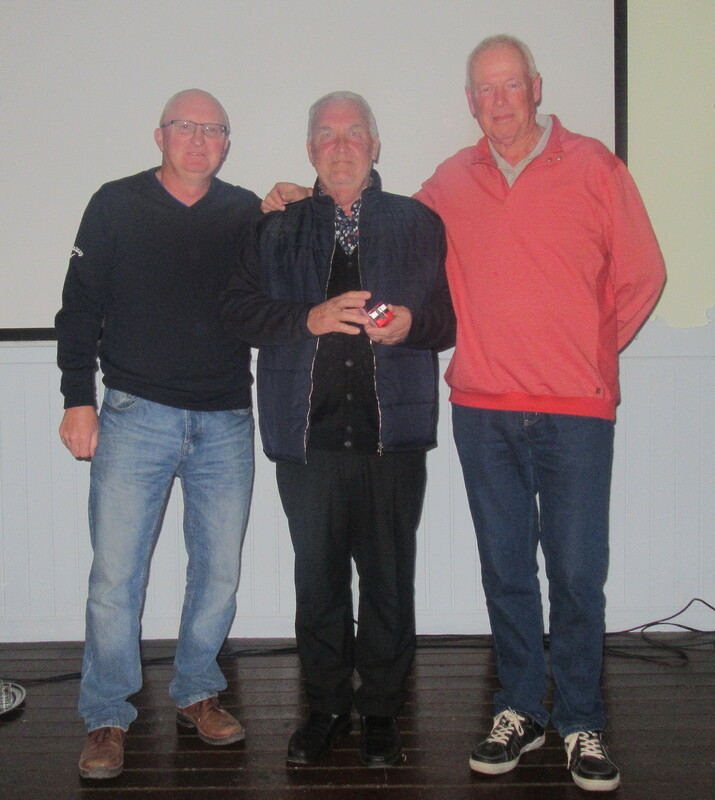 Jan Jakobsen was the winner on the day with an excellent score of 41 points. This was his third win since the competition started back in October 2011. Thanks again to Tanya who acted as our starter again this week. Alicia is back, winning the ladies……………….. 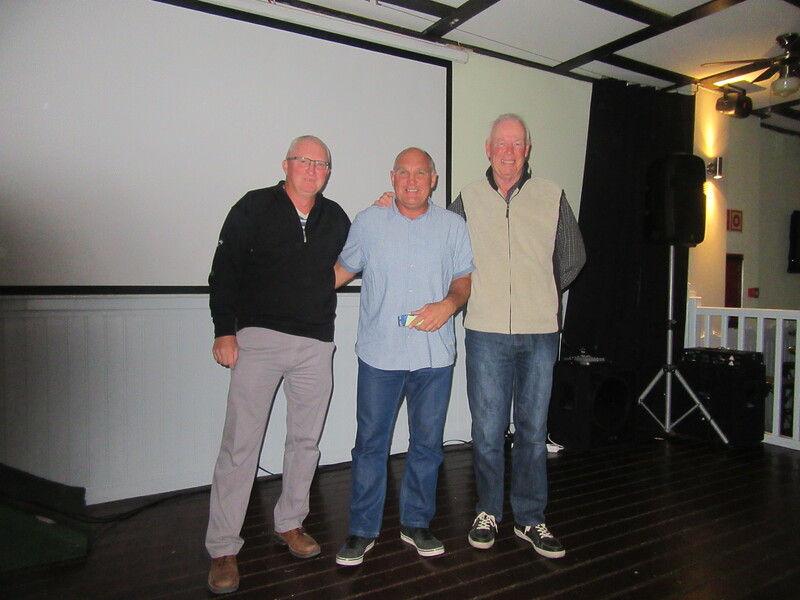 Thanks to Eddie Reid who has again offered to sponsor the additional prize to the winners – a sleeve of balls each, every week. Also to Chris and Maria in the Clover, who continue to provide shots (of alcohol!) for anyone managing a two in an individual competition, and the sandwiches after the Friday presentation. 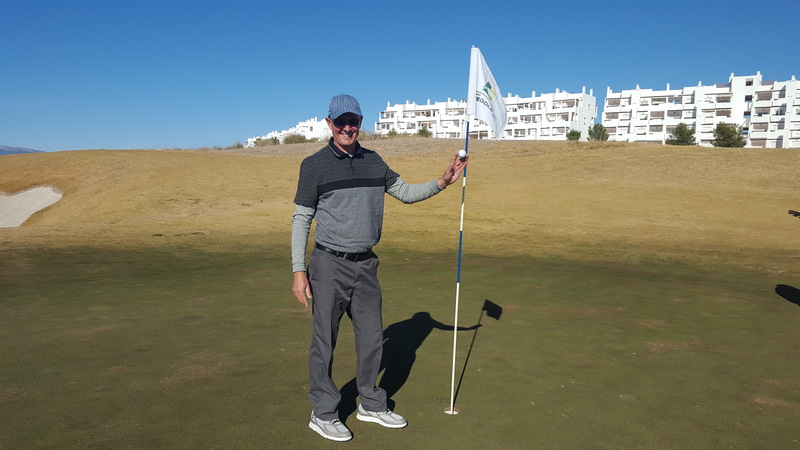 Captain Ken Saunders could invest in a pencil bag – the only implements he uses are a sand wedge, a rake and most importantly, a ball scoop………………. and yet another bunker on the 10th…………..
the flag position on 11 hasn’t moved in two weeks – the forward tee helps the men, but the ladies found it much harder………. The new price list for membership of the GNK courses has just come out, and it is not good news for families. The price for a family of four (2 adults plus 2 children up to 18 years old) is now almost 3000€, a rise of around 700€. Also anyone needing a buggy has to find someone to share it (not always easy with a cheaper walking rate alternative, and it limits your choice of partner) or pay 32€ on top of the walking rate (GNK members 25€). 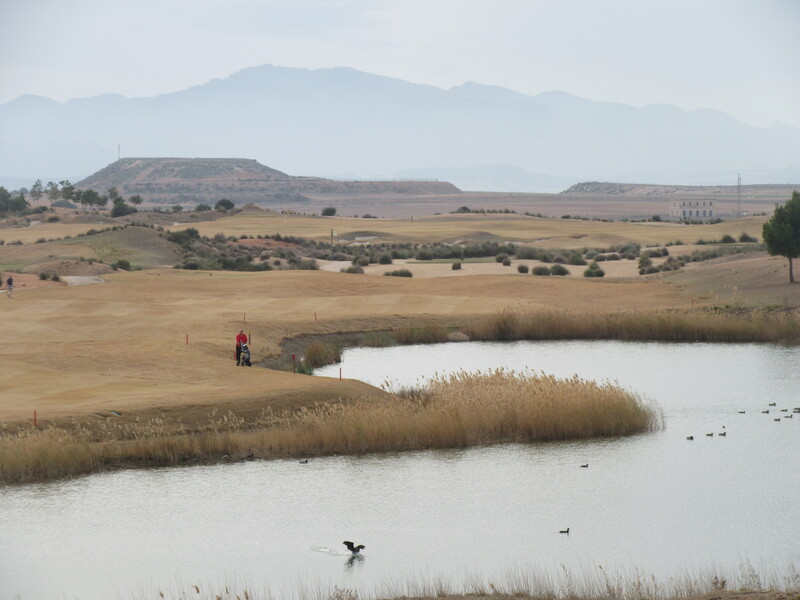 The members also have to find another euro on the green fee which was 8€, now 9€ for every round they play. Our CDA society members are not happy, but this has also not gone down well at the other 5 courses. The option to rent a buggy for a year has also gone. 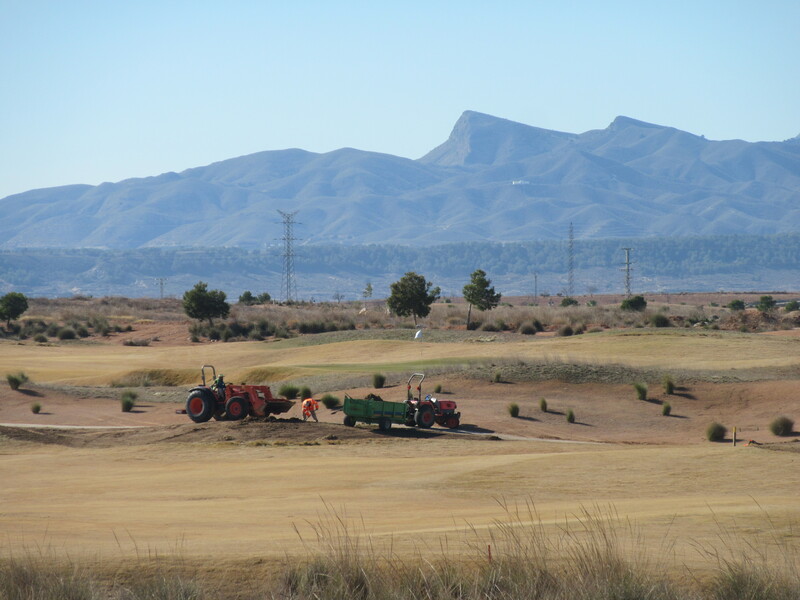 Our new golf management system, Handicapmaster, has been operating for 12 months and so we now have sufficient data to suggest a more accurate ranking of hole difficulty at our Condado de Alhama Signature course. Admittedly, this is normally done from the white tees with the best players, but as practically all mens’ golf is played from the yellow tees we feel that this is sufficiently relevant. The information has been passed to the management company as an option. As expected, hole 10 is the toughest hole! 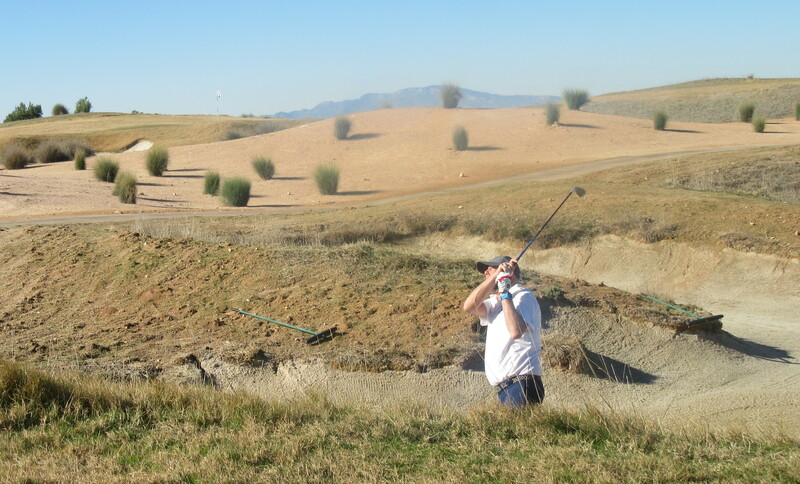 Following suggestions from members the committee have changed the slope allowance cut off between division one and two – it was felt that 1st division players should not have 2 shots at any hole. So now all players up to 14.9 handicap are division one (maximum 18 allowed), the rest in division 2. Next week is a pairs stableford.